I’ve been in a bit of a hooking “funk” lately. ….and that’s unusual for me. I just haven’t really felt like hooking most evenings, and as a result I’ve made very little progress on my “Grumpy Owl”. 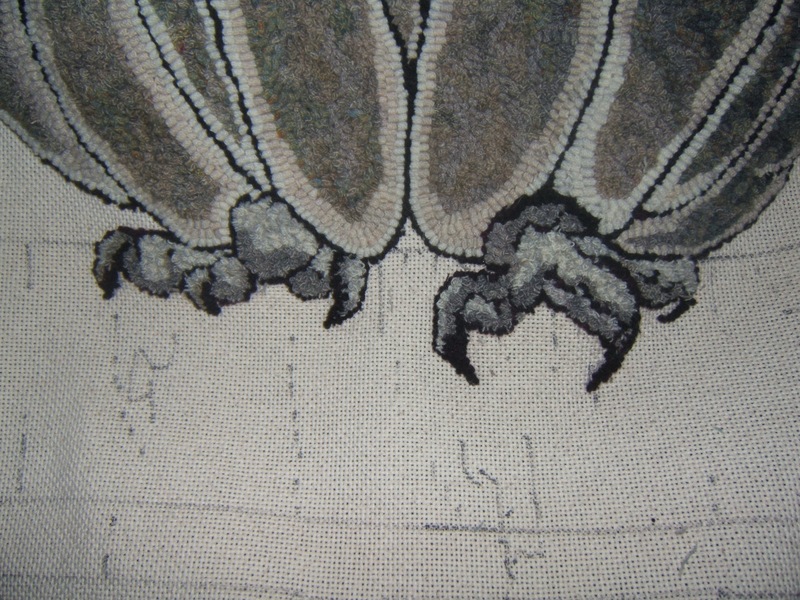 I’ve done another layer or so of feathers on the left and I’ve completed both talons. I love the way he looks, so that isn’t why I don’t particularly feel like hooking. I used #2 and #3 cuts for the feet. The #2 cut is tricky to hook with, but very effective in spots that need a fine line. Many wools won’t hold together with such a narrow strip, but I’m using a cashmere which is very dense and works quite well. I’m pulling the loops quite high so that they will not be lost when surrounded by a wider cut. As I putter along with the body, I’m debating how to hook the background. Originally I was going to do it in a “sepia” sort of colour, remaining true to the original neutral picture drawn by Mathieu. Now I’m debating about using colour….perhaps creating a gentle sunrise….indicating he’s not so much grumpy as tired and ready for a day’s sleep. Or another thought is a pastel colour arching out deeper as it moves away from his body to create a bit of aura. ….still debating with myself…. But back to my funk……maybe I need a shot of colour motivation ….while I like the neutrals, I think perhaps I’m momentarily colour deprived. I decided to think about a possible “next project” and went looking for inspiration. I soon realized that everything that attracted me had a strong and vibrant colour palette.The wools I’m using now are drab and ugly as they sit in a heap around me, so maybe I’ll have to make piles of gorgeous crimson, teal gold etc. to surround me as I finish hooking my owl, or maybe I’ll give in and introduce colour to the background….ummmmm….decisions, decisions. 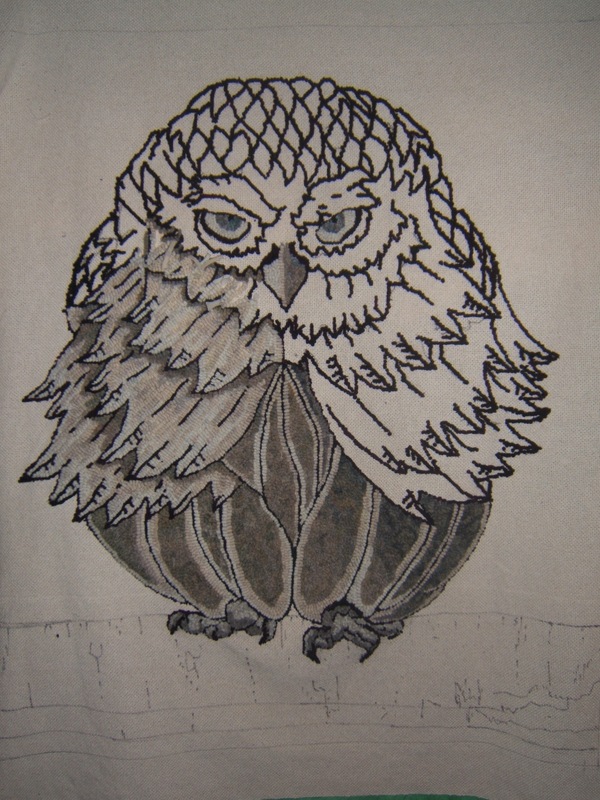 This entry was posted in animals, backgrounds, choosing colours, Grumpy Owl by elizabethmartel. Bookmark the permalink. Let the colours out Eluzabeth You need them..but take a break too, sometimes needed. Yes Anne, maybe a break is required. I’ve had a lot of hooking to deadlines this year so perhaps it’s just time to slow down and relax a bit. I live what you have done with your owl, Elizabeth. I find the results of your “drab and ugly” colors to be dramatic and sophisticated. Cannot wait to see this piece finished! I think your owl is incredible, I just love him. I do understand about the working with dull colors but he is going to be wonderful when done. So go get a color fix then onward can’t wait to see him all finished……. So glad you like him Sue. I think I’m going to dye some wool to get my colour fix….something rich and vibrant ………..and I did hook this evening.